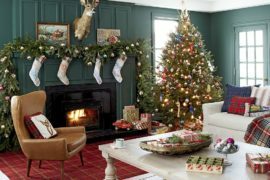 Christmas might be knocking on the door outside and if you haven’t got your home ready yet for the big week ahead, then it is high time you got started on the decorations. 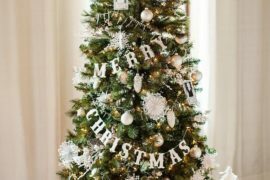 Much like every year, we already shared with our readers a host of DIY Holiday decorating ideas, lovely lighting fixtures and even homemade alternative Christmas trees to ensure that they are all set for the jolly times ahead. 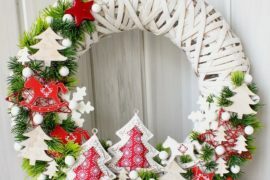 So, you have pretty much everything in place and are looking for something that adds an extra ‘pizazz’ to your holiday decorating. 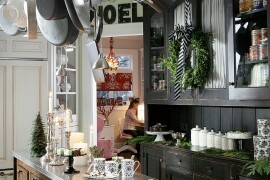 And idea that might not be strictly ‘festive’ and will serve you well beyond the New Year. 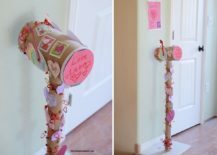 It is for you crafting addicts that we bring the DIY mailbox! 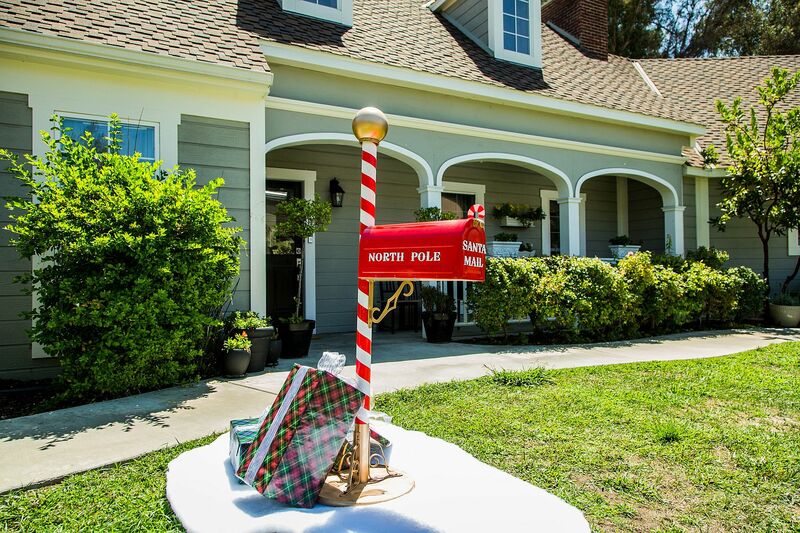 DIY Santa Mailbox is a perfect way to welcome Christmas home! 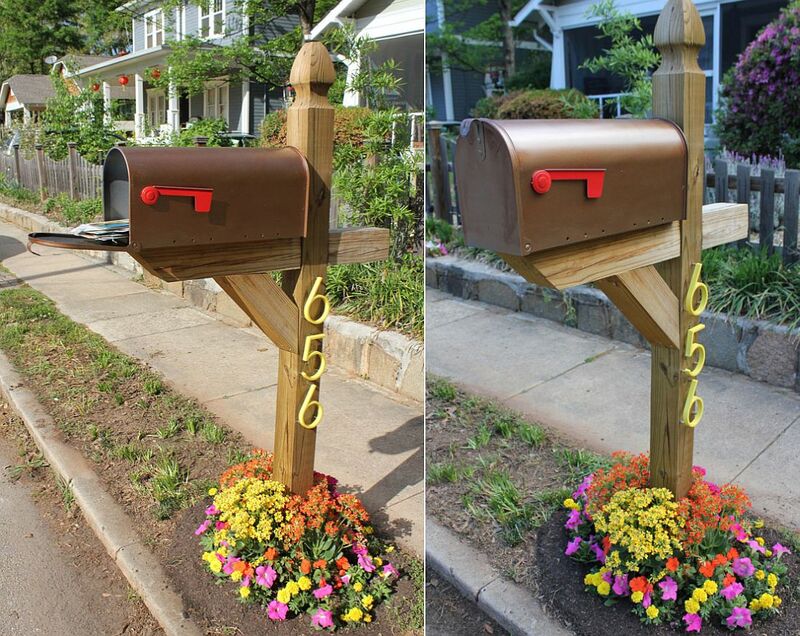 It is hard to give an entryway a more distinct look than by adding a homemade mailbox. 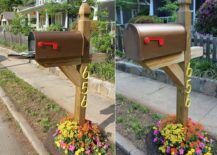 They are easy to craft, allow you to recycle and reuse the old, discarded mailbox in the corner and give your home a classic, timeless look. 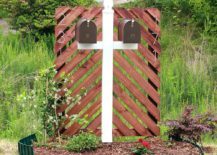 You can choose a DIY mailbox that complements the style of your entryway, overall silhouette of your residence and its aesthetic appeal. From the modern and bright to the metallic and quirky, we have them all. 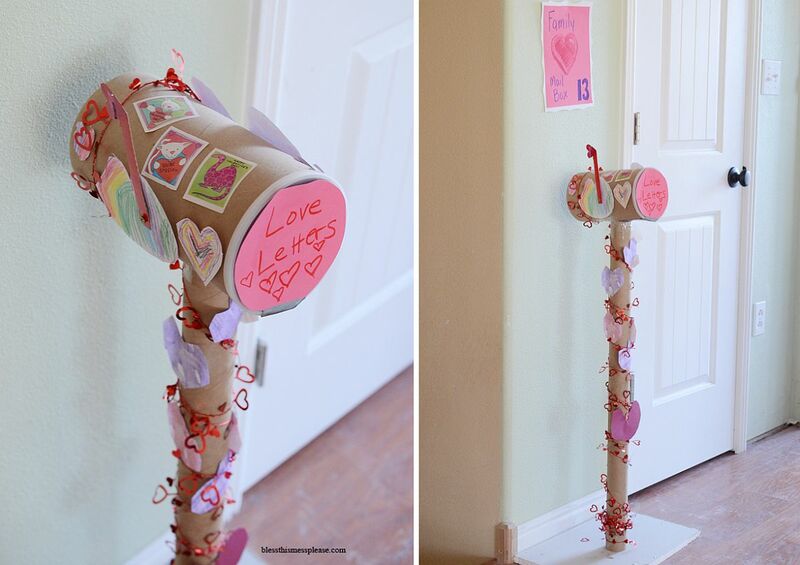 Then there are those fun designs your kids’ will absolutely adore. 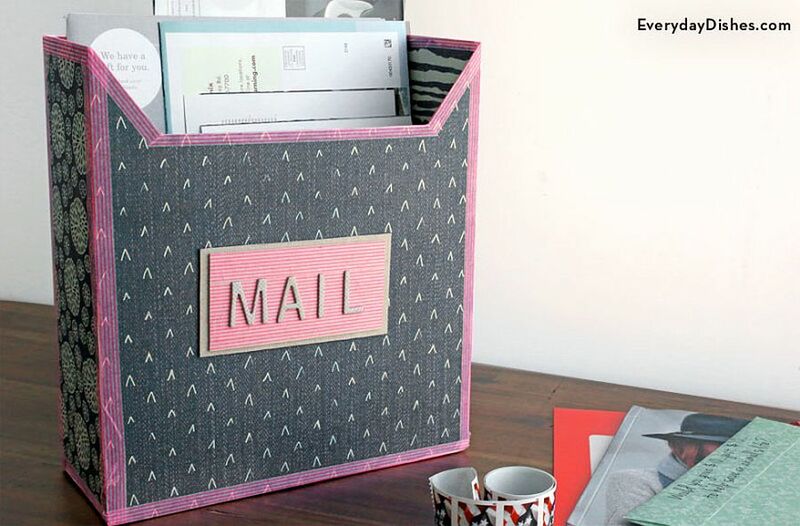 Time to greet your mail in a whole new fashion! 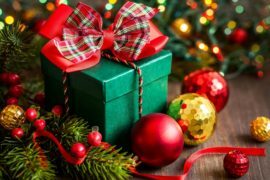 In a world where communication is more instant and e-mail seems to have largely replaced traditional mail, the Holidays is when time of the year when you still see plenty of mail flying around. What better way for your kids to receive a reply from Mr. Kris Kringle and his buddies at the North Pole than a custom DIY Santa Mailbox. You can rest assured that it will put a smile on the face of everyone who drives by your home even beyond Christmas. 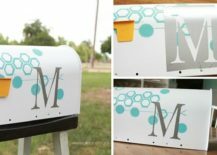 Beyond the festive theme, we take a look here at some trendy and sparkling DIY mailboxes with a metallic seen. 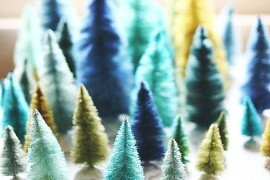 RELATED: 15 Festive DIY Gift Box Ideas for a Personalized Christmas! 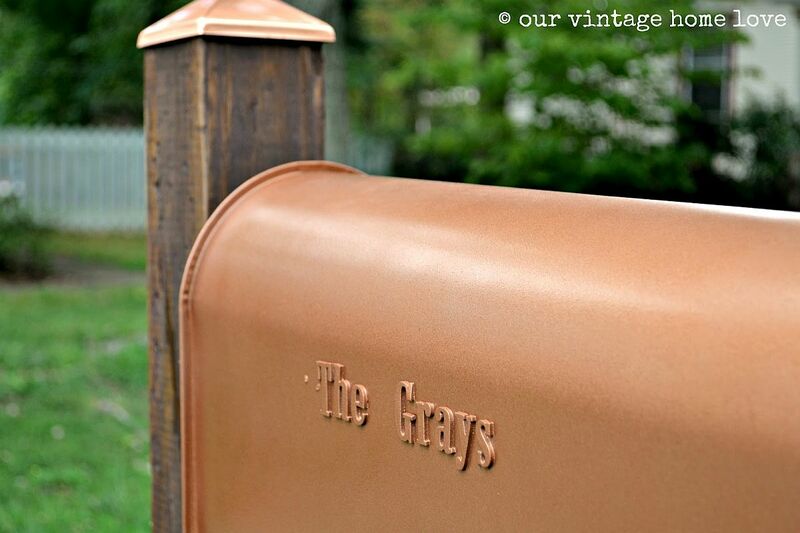 A custom mailbox with a matte brass finish and a unique mailbox statement screen ensures that the curb looks and feels simply sensational. As we talked about earlier, this is the perfect way to welcome guests and give your already exquisite home a timeless facelift. 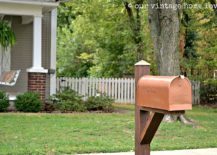 A bit of copper metallic paint, a new stand for the mailbox and some number stickers are all you need to turn that dented, old mailbox that you found outside into a statement piece for the front yard. 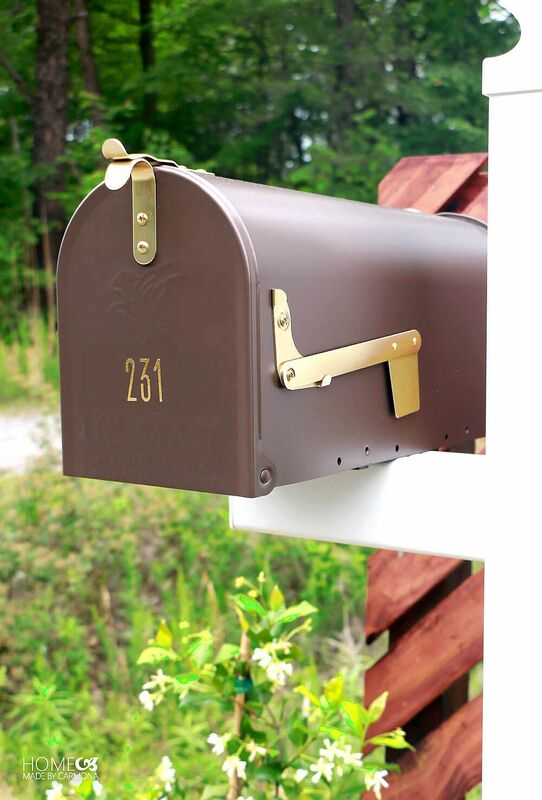 Not everyone is fond of the metallic craze going around and you might prefer a mailbox that is more in tune with the overall style of your home. Not to fret, as we have a great and cheerful DIY mailbox made with some help from mod podge that is ideal for coastal homes. 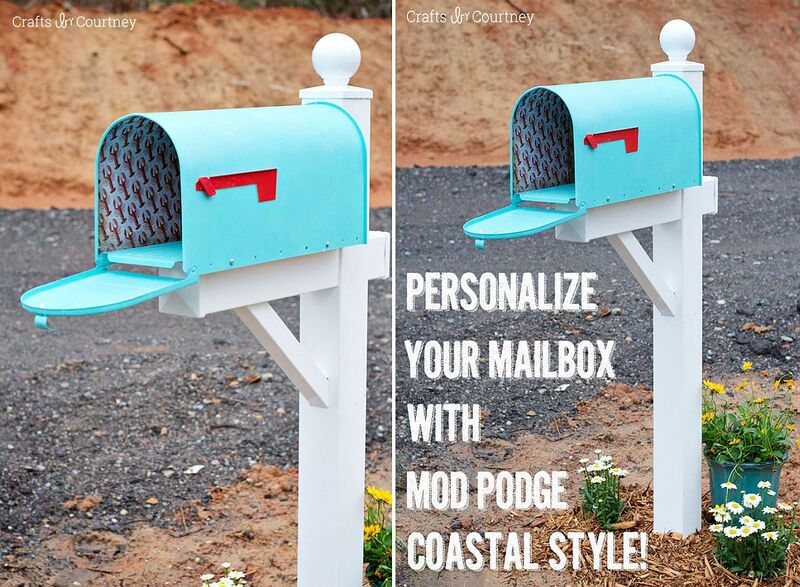 With its white and blue color scheme, this homemade mailbox can cozily sit outside your beachside vacation home greeting guests and friends gleefully. 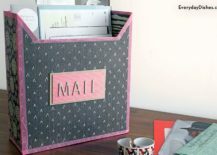 Lolly Jane turn to hexagonal prints and white for a chic and contemporary DIY mailbox while a few flowering plants around the mailbox is an idea that works well as you start planning for spring. 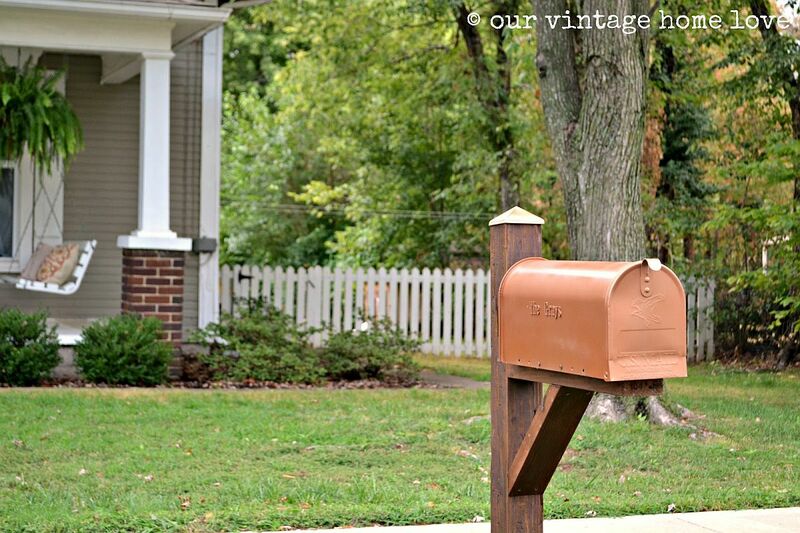 Creating the perfect space for your mailbox! 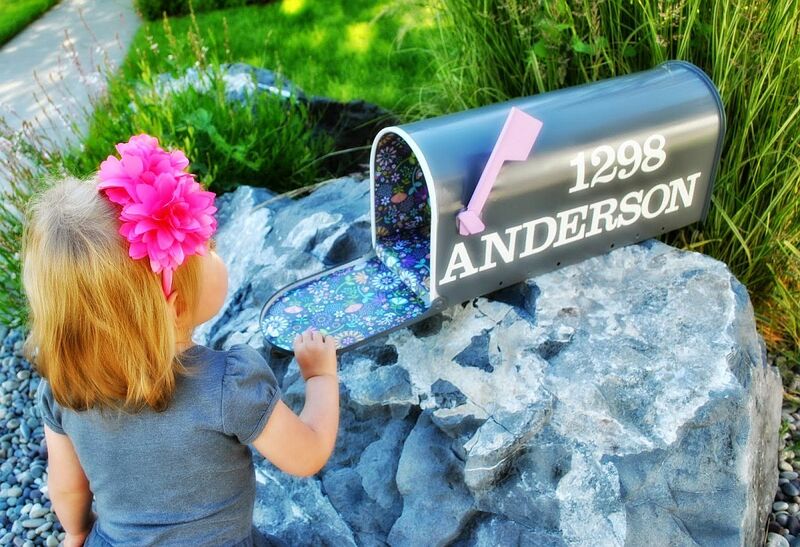 Reusable stencils, colorful paper, a paint brush and a dash of creativity can transform pretty much any old mailbox into a bright and beautiful piece that attracts everyone’s attention. 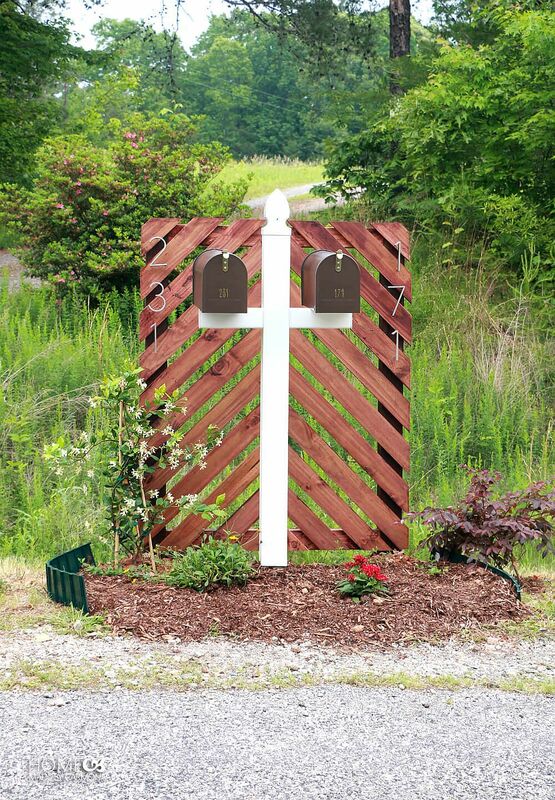 Sure, this might not give you a sturdy mailbox that withstands the test of wear and tear, but it will still make a great Holiday addition. 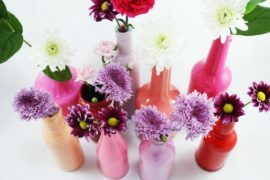 You can give it another simple makeover after the holidays using a can of paint for a more permanent sheen. 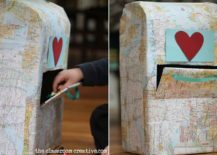 The family Valentine’s mailbox is an idea that can easily be adopted for Christmas with the obvious decorative changes while the cardboard mailbox covered with maps is a fun little project that your kids will enjoy. 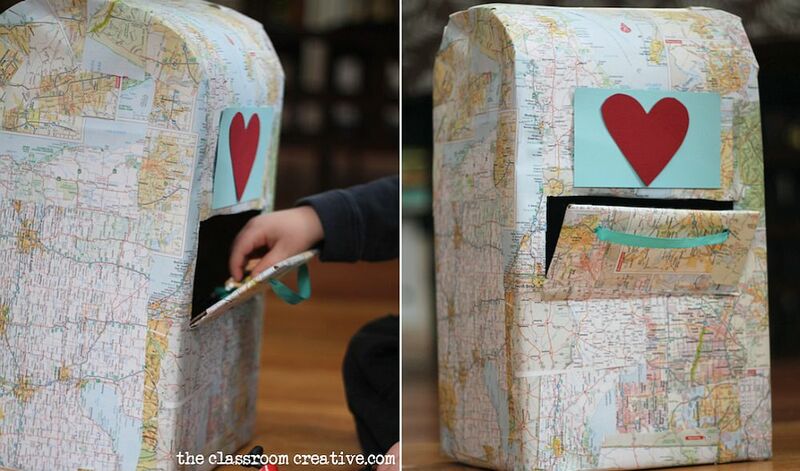 Another easy, indoor mailbox is the one we discovered on Everyday Dishes, which was crafted using a cereal box. It also can double as a lovely organizer above the work desk!